Location-aware social recommendation sites are so hot today. Recently, I wrote something about AT&T’s plan to release its Buzz service, possibly to go up against Yelp, Foursquare and Gowalla. Yelp and Foursquare has been getting their share of publicity lately, and now here comes Gowalla with some nifty additions to its already interesting services. 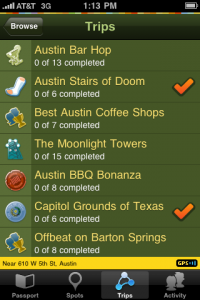 If you haven’t used Gowalla either on your iPhone or on the web, the concept is pretty simple. You create an account, add Trips, Gowalla’s term for identifying places you’ve visited including your opinions about those places and share them with other Gowalla users. Whereas before, trips were curated by the Gowalla team, now you can create your own Trips, describe these Trips and add up to 20 spots that you have visited before and then published it for your friends to see via the Gowalla app that they are using. To make adding Trips more fun, Gowalla will also start featuring unique and exciting trips. These trips will be promoted on the merits of their quality and relevancy and the number of people who completed the trip. Custom pins or badges, which are the stuff that make Gowalla more fun will be given to Gowalla members who have completed trips published trips by other members. In addition, you can now create bookmarks of spot pages at Gowalla.com. You can then view your bookmarks from your iPhone. This will also be available to other mobile devices soon. Alright, I know you’d appreciate these features if you’ve used Gowalla, either from the web or on your iPhone. If you haven’t tried it out, now may be the best time to do so. You might find it cool.